Serving Sarasota and Manatee Counties for over 17 years. Member Greater Sarasota Chamber of Commerce. Our many clients enjoy quality professional cleaning services on a consistent basis. Many of our newer clients were referred to us by our current satisfied clients. The clients of Cozy Professional Cleaning Services enjoy the piece of mind that comes with a reputation for quality service. All personnel are screened, thoroughly trained and insured. Family owned and operated, we are a full service janitorial company handling the cleaning needs of greater Sarasota for the past 17+ years. 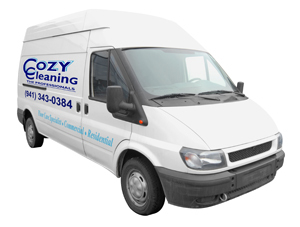 From office cleaning to construction clean-ups, carpet cleaning, upholstered furniture cleaning, floor waxing and window cleaning (commercial and residential), you can trust Cozy Professional Cleaning Services to do the job right. All work is fully supervised. Call us to clean your office building, medical facility, financial institution, school, retail space and more. Copyright © 2011 Cozy Cleaning. All Rights Reserved.